Flowers are definitely due for a comeback on your dinner plate. Edible flowers have almost vanished from our tables: over the last 150-200 years they’ve been relegated to the side of the plate as a garnish at best, or into a vase in the centre of the table as decoration. Yet for centuries flowers were considered an integral part of food the world over. The Romans used flowers such as dianthus (pinks), lavender and carnations. The Tudors ate all these and many others such as roses, cowslips, violets and bugloss. Households would make their own distilled flower waters, as well as expecting the kitchen staff to produce floral syrups, pastes, oils and vinegars. People would also make their own wine from wild flowers. Elderflower wine, or elderflower champagne seems to be about the only one that is still being made by people today. But you’ll have read about cowslip wine in classic novels – there’s mention of it in Cranford, by Mrs Gaskell, for instance. Vast quantities of cowslips were gathered to make wine: one internet recipe I found requires several quarts of cowslips to make the same liquid quantity of wine. You would be surprised to discover how many of the flowers growing in your garden or readily available from garden centres are not only edible but delicious. As well as adding new and complementary flavours and textures to a dish, flowers are of course strikingly attractive. Fresh blooms scattered over a green salad will look – and taste – stunning. Our Secret Garden Club workshop discussed how to grow edible flowers, with a detailed overview of which flowers can be eaten and how best to use them in your cooking. Don’t try to eat any flower unless you’re 100% certain what it is. Not all flowers are edible and some are toxic – we’ll see some in the Secret Garden today. Don’t assume that if the leaves, or roots are edible then the flowers will be too (tomatoes, potatoes). Don’t assume that just because close relatives are edible, then the rest of the family will be too (sweet peas vs mange tout). Many are neither poisonous nor palatable: they just don’t taste very nice or can be indigestibly fibrous. Know the provenance of any flowers you plan to eat. Even when you know what it is, don’t just pick any old flower and eat it. Flowers that have been sprayed with pesticides or other chemicals, or that grow by the roadside, should be avoided. If you suffer from hay fever or any other plant allergies, be extremely cautious about eating flowers. Flowers contain pollen which is a well-known allergen. Even if you don’t have these intolerances, try a little bit, like a food tester, the first time you taste a particular flower. In any case, if the stamens – the interior stalks which carry pollen – are at all prominent, we usually remove them before eating the flower, as they and the pollen can taint the flavour. Having got what sounds like a list of negatives out of the way, let’s look at some flowers which are not just edible but delicious. Roses are one of the most familiar edible flowers. Crystallised rose petals are well-known, although you can crystallise any edible flower which has sturdy enough petals to withstand being painted and covered with sugar. Primroses, violets and hollyhocks are also delicious when crystallised and look amazing too. There are two ways in which you can crystallise flower petals. The first, and the quickest, is suitable for flowers that you will use straightaway as they won’t keep for long. As well as the flowers themselves, you will also need a paintbrush, an egg white and caster sugar. Pick your flowers and separate the petals if you are going to crystallise just these. The best time to pick flowers is in the morning after the dew has dried off but before the sun is too hot. Go over your picked flowers and check for insects – especially bees and earwigs, but also, especially with roses, blackfly and greenfly. With roses it is easier to crystallise the petals rather than the whole flowerhead. Pull the petals off gently, and remove the little white lip at the base of the petal. Lightly whisk the egg white until it’s foamy – this is just to disperse any globular bits. Then take a clean paintbrush and paint each petal with the egg white, both back and front. Then dredge, or sprinkle with caster sugar – or ‘wipe’ the petal across the sugar. We found dredging with a tea strainer gave the best and most even results. Lay the petals on greaseproof paper on a rack and dry out in the airing cupboard or a similar warm place for 24 hours – then use as soon as possible. The second method uses gum arabic, which you can buy from chemists or cake decoration specialists. Dissolve the gum arabic in rosewater or alcohol such as vodka in a solution of one part gum arabic to three parts fluid. You do this by putting the gum arabic in a screwtop jar with the fluid and leaving it to steep – this will take about 24 hours. Then paint the petals with the gum arabic, dredge with sugar and dry as before. Petals crystallised this way will last about a month. Making distilled rosewater is not that difficult and doesn’t require specialist equipment. Once made, this beautifully fragrant liquid can be used to add scent and flavour to jellies, meringues, and fruit syrups. There are lots of rose bushes in the Secret Garden, all of which have petals suitable for eating, but for making rosewater we only want the most fragrant of blooms. The best rose petals are those from a flower which is past the stage of being a bud and is opening out but is not quite in full bloom yet, and certainly not overblown. There are a number of ways to make rosewater. You can simply steep rose petals in water, bring it to the boil and let them cool, before straining the mixture. You’ll end up with a coloured liquid that might well be a bit sludgy and won’t keep for very long. Not much more effort is required to make distilled rosewater, which is clear and will keep for much longer. Put the trivet or brick in the middle of a large pot. Pack the rose petals around it up to the level of the top of the trivet or weight. Pour cold water over the rose petals until they are just covered. Set the bowl on the trivet or weight, put the lid on the pan and heat up to boiling point. 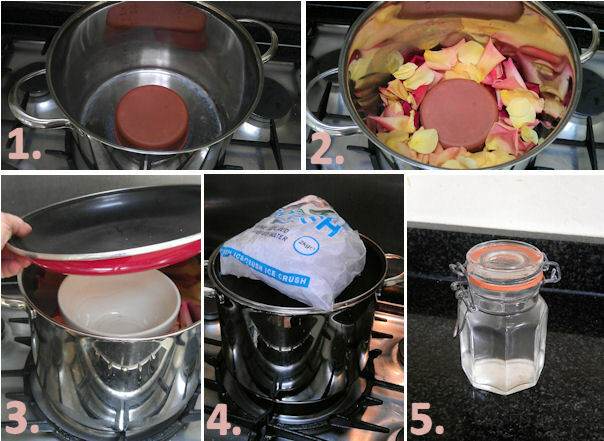 As soon as the water in the pan starts to boil, put a bag of ice on the inverted lid. Turn the heat down to a simmer. As the steam rises from the rose-infused water, it hits the underside of the lid, which thanks to the bag of ice, will be cold. The steam will then condense and run down the curved lid in rivulets before dripping into the bowl you set inside the pan. After 20-30 minutes, you should have a bowlful full of clear rosewater, which can be lifted out, cooled and decanted into an airtight jar. Once the water is boiling, it’s advisable to check once or twice that your set-up is working and that the rose-infused water is indeed filling the bowl. Carefully lift the lid to check everything is in place, then leave for around 20 minutes before checking again. Once you have the desired amount of water in the bowl, turn off the heat and carefully lift the bowl out of the pan. You should have beautifully scented rosewater. This rosewater can keep for up to a year, although it’s probably better to make fresh batches for cooking. 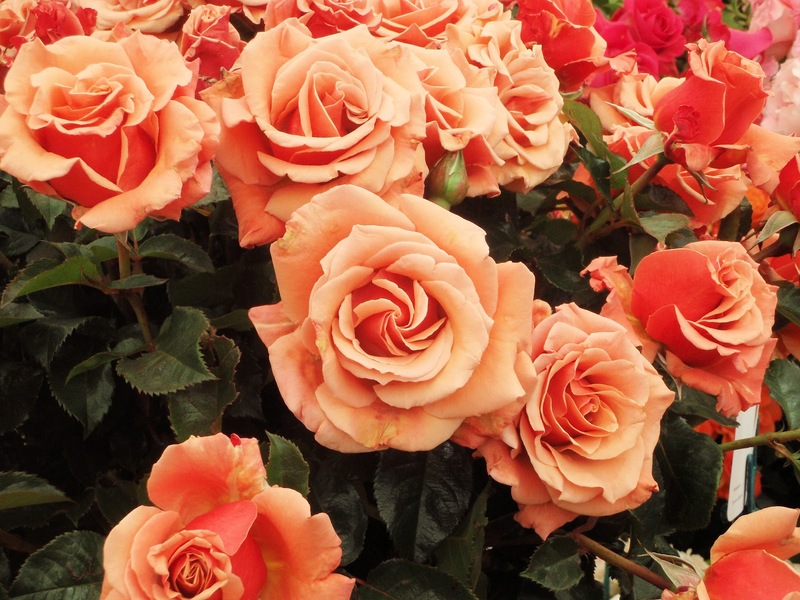 Roses are highly versatile plants: you can buy them for the patio, as small bushes or standards, or to plant in the open ground as bushes, or rambling over a hedge or climbing up a wall or fence. The flowers can be any colour from white to cream, yellow, orange, pink, red, purple, and that elusive blue rose. 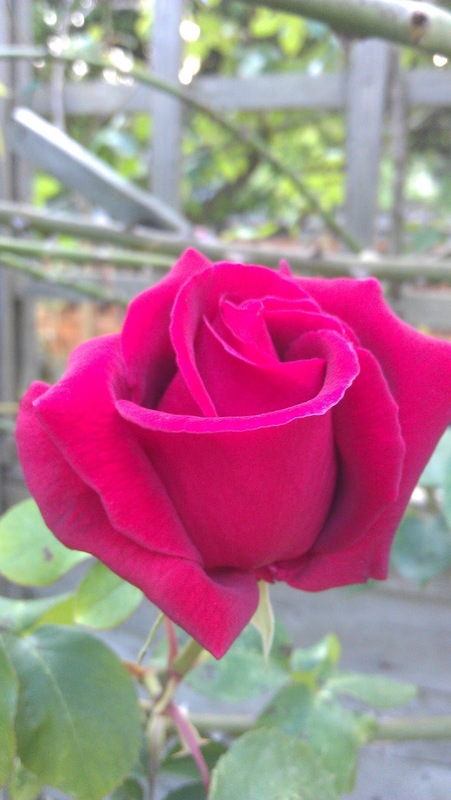 While new varieties are being bred all the time, there is always interest in old-fashioned roses. Not all roses have scented flowers (although I’m not quite sure what the point of an unscented rose is). Roses like fertile well-drained soil. You can dig in some bonemeal when planting. Prune well in early spring – February is a good time. Cut off dead wood altogether, then cut green stems down to above a notch or bud. Prune climbers more lightly than bushes. Don’t plant in the same spot where a rose has previously grown – roses are prone to too many soil-borne diseases to guarantee plant health. Roses are notorious for attracting greenfly and blackfly. If you are contemplating using the petals in cooking or for making rosewater, don’t spray with anything! Otherwise try a garlic dilution spray on the leaves. Or try companion planting: chives planted at the foot of rose bushes look very attractive, especially with their mauve pom-pom flowers. The allium scent is said to put off greenfly and blackfly, much as the garlic dilution does. Marigolds are also pest repellents, but you will usually be planting them out later in the year (about May), by which time the pests may have got a stronghold. And don’t forget rosehip syrup – technically this isn’t the flower you are eating, but an utterly delicious way to enjoy your roses and one that transports me straight back to my childhood. Lots of guides to herbs will talk about the need to pick herbs before they flower, as though the act of flowering does something terrible to the flavour of the herb. In truth, a plant which is concentrating energy on flowering isn’t going to produce the most flavoursome leaves, but what these people overlook is that herb flowers often taste good too and also, of course, look decorative on the plate or as a garnish. Basil flowers are small and white and taste similar to the leaves. Just as basil leaves go well with tomatoes in salads, etc, so do the flowers for dramatic effect. Or try a pesto with basil flowers as well as the leaves for an unusual twist. In the UK, grow basil indoors for best results. They will attract aphids for one thing, but also the leaves grow best and most succulently when not windblown or left to the vagaries of our weather. Lemon basil flowers have an intensely lemon basil flavour and are almost worth growing for the flowers alone. Different varieties, eg, purple, variegated, pineapple sage, all edible, tasting similar to the leaf. 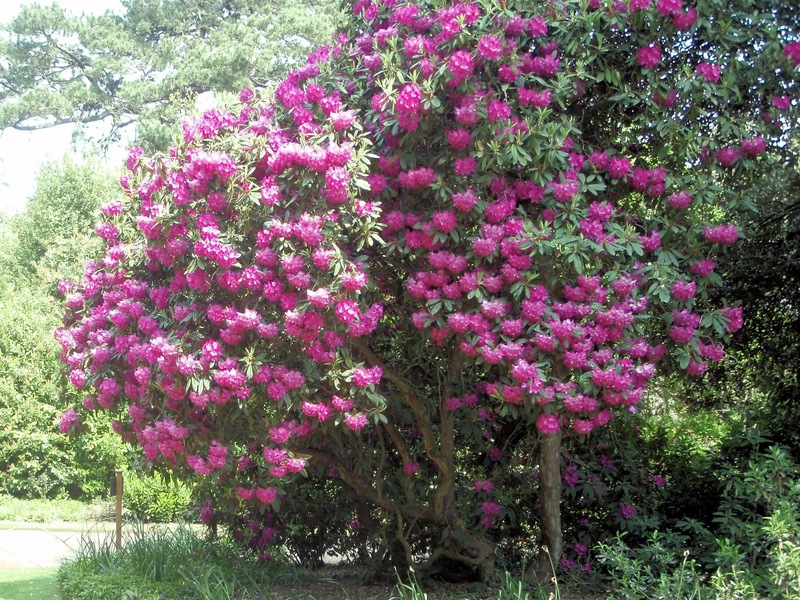 Flowers appear in late winter and continue through spring. The flowers on most varieties is a beautiful pale blue but there are a few pink ones. Rosemary flowers make a delicious and very pretty flower butter. Back in January when we talked about herbs and medicinal plants at the Secret Garden Club I mentioned briefly the idea of making rosemary butter and freezing it as a way of preserving the rosemary. I reckon rosemary flower butter is a step up from that. The blue also looks stunning set against the red of tomatoes or peppers in a salad. One of my favourite flowers both to look at and to eat. Remove the stalk and pull off the petals, scattering them over salads, home-made pizza, jacket potatoes or potato salad. Chives are a versatile plant: they grow well in most soils. Once established the plants will grow clumps which can be divided to give you more plants. They are also good as a companion plant as the onion scent is off-putting to greenfly, blackfly and the like. So they are a good bet to plant under roses or around anything that is vulnerable to aphids (eg, lettuces). Garlic chives are every similar to chives although they have slightly flatter and larger leaves, and a distinct garlic tang to both leaves and flowers. The flowers themselves are white and extremely decorative as well as tasty. Dill is a fast-growing annual herb with frond-like leaves with a strong aniseed flavour. The flowers have a similar taste, and it’s useful to know that they’re good to eat because dill is prone to bolting as soon as you get a spell of dry weather. So don’t despair, use the flowers instead of the leaves. Put whole flowerheads into cucumber pickles for a dill flavour and attractive looking brine. The tiny flowers taste similar to the leaves, and are good scattered over freshly cooked vegetables such as broad beans, carrots or turnips. They can be fiddly to handle but try to remove as much green stalk as possible. Thyme is a Mediterranean plant and likes sun, poor soil and not too much watering. It can be grown from seed but it’s much easier to grow one plant and then divide it in spring. The flowers are tiny but bear all the lemon-cologne flavour of the leaves, so if you find you have lemon balm in bloom you can take the opportunity to use them in ice-cream or to make an exotic floral vinegar. They will add a lemony kick to soft bland salad leaves – think of lemon balm flowers scattered over lamb’s lettuce. Mint flowers taste as lovely as the leaves. Use the petals rather than the green stalk and calyxes. Grow mint in a pot unless you want it to take over the whole garden. Keep different varieties of mint separate or else they will cross and lose their distinctive characteristics. Plants can be propagated by taking softwood cuttings in summer, or by dividing in spring or autumn – small lengths of root will establish quite happily in the soil. Marjoram butter is delicious. Oregano flowers can be used to great effect where you would use dried oregano: pizzas and Greek salads spring to mind. Marjoram and oregano are essentially the same plant even if I do associate one with English country gardens (marjoram) and the other with Mediterranean hillsides (oregano). They grow well in not-so-rich soil and can withstand dry conditions. This is one of my favourite herbs for making herbal tea or adding a cologne-like kick to homemade lemonade. If you have a lemon verbena bush it’s impossible not to rub a leaf or two as you walk past and let the scent waft upwards. The flowers, which are tiny upright white panicles, are powerfully flavoursome as well – pick out the petals and decorate your sundowner with them, or scatter over lemon sorbet. Borage is the classic flower to serve with drinks, either floating on the top or frozen in an ice cube. Certainly the blue flower with the black dot in the centre is very beautiful and the taste is reminiscent of cucumber. I much prefer eating the flowers to the leaves, which also taste faintly of cucumber but which I find a bit too coarse and hairy for my liking. With borage you can keep the stamens but try to remove the green calyx. It’s an easy plant to grow, an annual which will self-seed freely. So start your borage off by sowing seeds direct in the ground or in a large pot in spring. Growing in a pot will contain the plant but you might well find it self-seeds and springs up elsewhere the next year. Nasturtiums are my garden supercrop. The leaves are great shredded thinly in salads, where they add a pungent peppery kick. The flowers are delicious and look particularly striking on the plate. The seedheads can be pickled in malt, white or cider vinegar when they look and taste remarkably like capers – they’re known as poor man’s capers, but I think they’re delicious in their own right. Nasturtiums are ridiculously easy to grow – they’re happiest in a poor soil and they like sun. Sow them in situ in spring once the danger of frost has passed. They look wonderful scrambling through other plants such as beans or peas, or tumbling out of a container. They will attract insects, both beneficial and pests such as blackfly. Try to wipe the blackfly off before they get a stronghold. I think no English garden is complete without at least one lavender bush. That lovely fragrance that lifts the air as you brush past it – how could anyone bear to live without it? Even better, is a low hedge or border of lavender: clouds of grey-green foliage topped with dusky blue, buzzing with bees all summer long. The flowers provide an easy and beautiful way to bring the unmistakable lavender fragrance into the kitchen. Lavender flowers are surprisingly versatile in the kitchen. You can add lavender flowers to an airtight jar of sugar; the resulting infusion makes wonderfully scented desserts like lavender panna cotta, lavender crème brulee, lavender ice-cream, lavender syrup for pouring … and then there is the possibility of lavender vodka, made by steeping lavender flowers in vodka for several weeks and then straining. Once you have one lavender plant, it’s easy to propagate by taking softwood cuttings in the summer. I’ve never grown it from seed: it’s always been easy enough to ask for cuttings if I see a variety I particularly like (there must be friends of mine who dread me coming round with a pair of scissors and a plastic bag …). Squash flowers, stuffed with goat’s cheese or ricotta, dipped in a tempura batter and deep-fried, are always a treat and manage to both taste and look exotic. Each squash plant will produce both male and female flowers. The male flowers appear first and these will pollinate the later-developing female flowers. You can always tell the difference easily: the female flowers have a courgette or squash fruit developing behind the flower; the male flowers only have the thin green stalk. If you have a glut of courgettes then a particularly showy starter is to pick a female flower + tiny fruit together and deep-fry them together. Otherwise pick male flowers and save your fruit to use as squash/courgettes on their own. Don’t pick all the male flowers at once though, or your female flowers won’t be pollinated. Courgettes and squash seeds should be sown indoors in pots: two seeds to a pot and then the weaker seedling thinned out once they’ve germinated. Once they have true leaves, they’re ready to be moved outside to be hardened off, ie, the plants are allowed to become gradually accustomed to the colder, windier air outside. Then they can be transplanted to the open ground. They like a rich soil so if you have manure or better still fully composted kitchen waste, dig that in before you plant out the squash. They do have a tendency to ramble all over the garden – if you don’t have the space for this, you can train them up a fence or trellis. If you have a particularly rampant squash plant, nip out the growing tip after it has produced 3-4 fruits, then it can concentrate on growing these fruits to a decent size, instead of lots of little ones at the stem which probably won’t make it to maturity in our season. Courgettes should be picked regularly, otherwise they will grow into giant marrows and the plant will stop growing more courgettes while it’s putting all its energies into the marrow. Squash should be lifted before the first frost an stored somewhere warm, dry and light to finish ripening before you eat them. As a general rule, when preparing flowers for eating, remove stamens (the strands in the middle of the flower which carry pollen), and remove the calyx (the often green parts between the petals and the stem), if large. With some, eg, violas, and rocket and mustard flowers you can eat the whole flowers, but with most you should remove the more indigestible parts. The flowers look stunning at the back of a cottage garden border (or anywhere really – once hollyhocks are established, they will happily self-seed all over the place). They also look stunning on the plate. The flowerheads are big enough for you to be able to remove the stamens and green calyx so that you eat just the petals. Most lily flowers are toxic, but Hemerocallis, the day lily, is safe to eat and delicious. You may have seen ‘lily bud’ mentioned on Chinese or Korean restaurant menus and this is what they are, Hemerocallis originating from the Far East. The flowers have a sweet sugary taste, and are often eaten in stir-fries and soups. Their bright orange colour will brighten up a salad as well. To grow well, they need a sunny spot and moist spot and can also be grown in containers. I can never quite get used to daisies being edible – but they are. I find the petals can be bitter, especially if you use the whole flowerhead, but they can be stunningly attractive scattered in salads. It also seems strange to explain how to grow a daisy – most people have them in lawns, as we do in the Secret Garden. This year we’ve also grown some pom-pom daisies here at the edge of the border because daisies are prolific self-seeders and we want to get a greater variety in the lawn. If you do need to grow daisies from scratch, then sow them direct in spring then once established plants can be divided after flowering. Hibiscus flowers have a slightly tart flavour. Dried flowers are used to make a mildly astringent tea, however, they can also be ground and mixed with sea salt crystals to make hibiscus salt. This will add a citrusy note to your seasoning and the crimson flakes will look spectacular on your dish as well. Hibiscus flowers are also preserved in syrup and can be served to dramatic effect in champagne and cocktails. Hibiscus are tropical plants and won’t survive a British winter unless you bring them indoors or protect them. You can propagate by taking cuttings. Some parts of the sunflower are more edible than others. You can eat the buds whole, rather like a globe artichoke without the fuss of picking bits off. Once the flower has opened, however, only use the petals, which can be eaten raw, or tossed in a stir-fry at the last minute, or stirred into a risotto, maybe. Once the flower has set seed, the seeds can also be eaten, although they need to be shelled first, which can be a slow and nail-breaking experience. Sunflowers can be sown from seed, either direct into the ground or in pots indoors before planting out. If your ground is at all populated by slugs and snails, then sow indoors and protect the seedlings from slugs by popping a copper ring over them when you plant out. Tall sunflowers may need staking if they grow very big very quickly. These pretty pink flowers are edible with a slightly lemony taste, but to be honest the flowers can be more decorative than flavoursome: it’s the leaves that pack the punch for taste. Good with desserts. Best grown in containers, since they’re not frost-hardy and need to be brought in for winter. Thankfully they do well in pots: place in full sun in late spring and leave outside until the nights become chill in the autumn. Propagate by taking cuttings in spring, or in autumn to overwinter. Elderflower cordial is one of my favourite soft drinks but I’m ashamed to say I mostly buy it from Waitrose. The large foamy white elderflower flowerheads are everywhere in May and June and apart from the cordial can be dipped in a tempura-style batter and deep-fried. Somewhere in the last 150 years we seem to have lost the art of making wine from flowers and hedgerow plants, but cowslip flowers used to be widely used, not just for wine, but in pickles, syrups, to make mead, crystallised, made into cowslip cream. The mention of mead is a clue to the appeal of cowslips – the flowers have a distinctive honey aroma and taste. Pull them away from the calyx and if you don’t feel like making wine or mead, use them in salads or in the vinaigrette. Don’t feel too bad about the wine-making: you need around 1litre of cowslip flowers for 1 litre of wine. 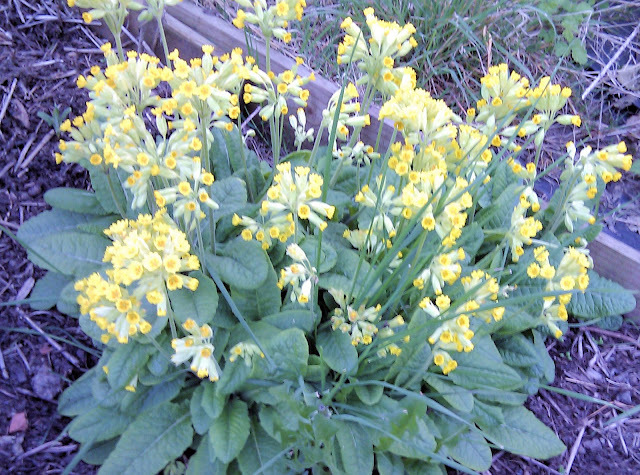 Primroses were used to make sweets in Victorian times. Crystallised primroses are beautifully decorative, but Kathy Brown in her beautiful book Edible Flowers suggests making a spring ice bowl with primrose flowers, violets and cowslips, which I think sounds heavenly, and just the thing for serving ice-cream and sorbets. Primroses like a bit of shade and are often one of the first winter flowers and always welcome on a cold wet day. Once established the plants will self-seed. Viola flowers are made for crystallising or for scattering over a salad to turn something mundane into something very special. Many varieties are sold in the UK as bedding plants – pansies, violas, sweet violets, all can be used in the kitchen. They can be sown from seed, but their ubiquity as bedding plants mean you might as well buy plants and keep them going. This is Calendula, rather than Tagetes, the French or African marigold. Calendula is used in cosmetics, especially creams, and has edible flowers. Calendula is a hardy annual and once established should self-seed in your garden. The flowerheads are much larger than those of French or African marigolds and the petals taste slightly spicy. Pull them off individually and use to make marigold butter, or in puddings or bread for an elusive flavour and a beautiful yellow-orange colour – the visual effect is similar to adding saffron. Calendula was used extensively in cooking in the olden days – in stews, soups and preserves. You can still buy large quantities of dried marigolds in markets in the Middle East (especially in Turkey) where it is used as a saffron substitute. Having said that many flowers are edible while many more are either tasteless or have an unpleasant texture, there are also some flowers which are actively poisonous. It’s not just that they don’t taste nice, they would actually cause you harm. Plant toxins can be very powerful – even in The Secret Garden there are some plants that could kill you. Potatoes, tomatoes, and the Chilean potato vine (Solanum crispum): In all cases the flowers are poisonous, as are the leaves and stems. Tomato fruits are edible of course, but it’s worth knowing that the similar fruit produced by potatoes are also toxic. Sweet peas (Lathyrus odorata): just because other types of pea are edible, don’t assume that they all are. Peppers (Capsicum annuum): both sweet peppers and chilli peppers have inedible flowers, despite having edible fruits. Asparagus: you can only eat the immature stems and buds. Datura, or Angels’ trumpets: a popular patio plant with a heady fragrance. The whole plant is poisonous. Most lilies, as mentioned above. And note that this is not a exhaustive list. Don’t let that put you off. Edible flowers can add an extra dimension to a meal – they can complement the other ingredients, eg, basil flowers with tomatoes, a citrus flower on lemon drizzle cake. They can add a different flavour, a different texture to something otherwise familiar and give it a touch of the exotic. And this high impact comes for very little extra outlay, if you have a garden with the flowers growing in it. Make sure you know what plant you’re eating – grow it yourself or have it clearly identified. If you suffer from hay fever or any other kind of pollen allergy, be very cautious indeed. Use the flowers as fresh as possible. Don’t pick all the flowers from one plant. 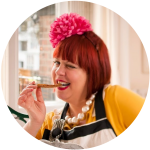 Supper Club, by Kerstin Rodgers, published by HarperCollins, has a short chapter on crystallising roses and an edible flower menu with recipes. How to make your own rosewater at Care2.com and How to make rosewater at www.Tipnut.com inspired us to try making our own at the Secret Garden Club. Please eat the daisies: 13 edible flowers you should eat but probably don’t, on Chow.com.